U.S. Senate candidate Mike Espy met with students and local feminist groups in Oxford this weekend before traveling to Jackson for the opening of his campaign office. Espy visited campus Friday morning for an exclusive interview with The Daily Mississippian and later sat down for lunch in Odom Hall with a student group representing various organizations around campus. He also spoke to local members of Famished Feminists and Wise Women of Oxford at St. Peter’s Episcopal Church just off the Square. Throughout his stop in Oxford, Espy repeated that he wants to use his representation to amplify student voices. “I think the opportunity to have met and discussed with so many different people their wishes and desires … talking with students about their disappointments about graduating and not having anywhere else to go — that’s meaningful, and I’ll be able to incorporate those ideas into my programs as senator,” Espy said. Espy was referencing the phenomenon known as “brain drain,” in which college students graduate and leave their school’s state in search of employment elsewhere. Mississippi has recently felt the burn of brain drain, and the topic often surfaces when politicians talk about education. According to the U.S. Census Bureau, Mississippi has lost 4 percent of its millennial population since 2010. Espy, a Democrat, is running in November’s special election for the Senate seat left open by Republican Thad Cochran’s resignation earlier this year. Espy represented Mississippi’s 2nd District in the U.S. House from 1987-93 as the state’s first black member of Congress since Reconstruction. He later served as U.S. Secretary of Agriculture from January 1993 to December 1994. If elected, Espy would become the first African American to represent Mississippi in the Senate since Reconstruction. Espy said he carries his experiences with today’s Mississippi with him, and that’s partially why he’s running for office. He said he would be proud to represent Mississippi as a state looking forward to great things, with an African American representative at the national level. “I’m not running to be something. I’m running to do something. That’s very important. Because you can’t always choose history — history chooses you,” Espy said during his Friday afternoon lunch with students. 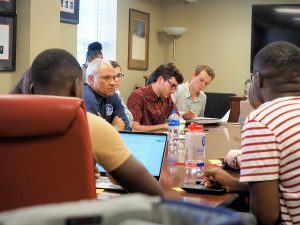 Senior international studies major John Ramming Chappell hosted the discussion, which featured members of the Black Student Union, College Democrats, Mississippi Votes, doctoral programs and other groups. Talk of education and college affordability dominated the conversation, and many students voiced their concerns about the state of public education in Mississippi. Political science major Kynnedi Henry said she’d like to see greater statewide access to quality education. Espy also laid out his policies on various controversial topics, including abortion, immigration and gun control. He claimed a pro-choice, anti-abortion stance and described his immigration stance as one for strong borders combined with moral policy. He mentioned his former involvement with rifle teams in college and explained his familiarity with the National Rifle Association. Espy gave his personal advice to the students and stated his eventual goals for all students in the state, even those who may travel elsewhere after graduation. With no partisan primaries before the special election, Espy will face incumbent Republican Cindy Hyde-Smith and Republican Chris McDaniel as well as Democrat Tobey Bartee on the Nov. 6 ballot. The top two finishers will face one another in a runoff election, barring a majority decision on Nov. 6.